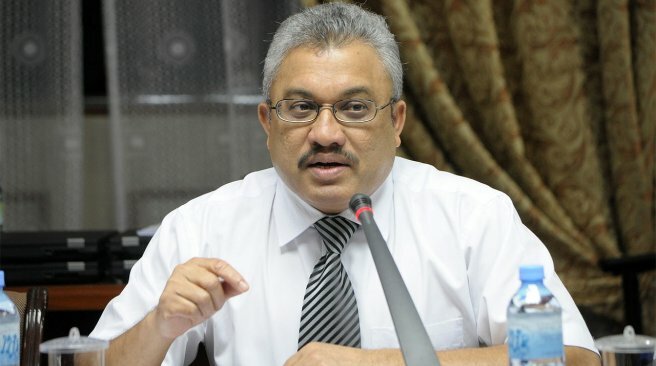 Our very “capable” Finance Minister Mr. Abdulla Jihad warns that more stringent and stricter measures may need to be taken since, wait for it…. there is no money to spend on the citizens of this country. What a surprise huh? You never saw this coming? Oh well..
After spending more than half the chunk of the budget on the Police and the armed forces, what’s the point of even talking about this? All development projects that were started have been halted for one reason or the other but firework displays for Maldivian Police Service’s anniversary took place in full swing. Dr. Jameel laid down the foundation for flats and office complexes for the very “needy” Police service that we have here. And I think the rest of the budget should be very wisely utilized to buy and distribute toys and sweets amongst the police force who made this “change” possible on February 7, 2012. This news piece brings to mind how Jihad used to mock and take that self righteous stance criticizing each and every financial policy that was put forth by the previous government. Apparently, the genius in financial matters turns out to be an inept man who is just taking us to the point of no return when it comes to financial woes. But who cares eh? It was last week Mr. Fazeel Najeeb, the MMA governor said that the financial situation is not “that worrying”. When should we actually start worrying? When we are left with nothing to eat and when all our bank balances run dry and we have to run after the politicians who actually brought this ruin down upon us? Where is Dr. Waheed, the self appointed President of this country? While he is mourning the fact that a parent refused to allow his child to shake hands with him (more people should do this in fact) the whole country is in an utter mess. But who cares huh? As long as he and Madam Ilham sports matching profile pictures up on Twitter, who cares about little things like the need to keep a country running for which finances are required? Right now, I would love nothing more than to go and shove each and every one of Jihad’s self righteous remarks up where it would hurt the most. And yes, I am serious. During PNasheed’s administration Jihad criticised about his economic policy of introducing taxation. Now what he’s proposed to the government is the same policy to implement which he told to the public as a failed policy. I wonder what’s his line of study which he got degree? If he really konws the economy he wouldn’t stand against the policy which was highly welcomed by IMF and World Bank with it’s recommendations and help. I can say Jihad isn’t more than a NUT.